Premier cloakroom furniture pack is a wonderful update for your bathroom. It has a round basin with an amazing finish that makes your bathroom look completely different. 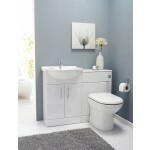 This also includes a basin unit, BTW unit, Dual flush cistern, BTW pan & Soft close seat and much more. Also, they are cheap and affordable so that anyone can renovate their bathroom. 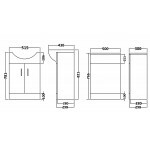 This product is one of the best type of the cloakroom vanity units with unique specifications and features.